Mirador Sicasumbre is the first astronomical viewpoint in Fuerteventura, and it offers great views over the island. If you go on the road FV-605 from La Pared towards Pajara, you will see a sign on the right about Mirador Sicasumbre and there's a small space on the side of the road where you can park the car. You have to climb towards the viewing point on a small trail that is marked and the journey will not take you more than 5 - 10 minutes. At the Sicasumbre Viewing Point you will understand where the island gets its name. A friendly warning regarding the wind here, which is the most powerful we've encountered in Fuerteventura. Here at Mirador Sicasumbre you will fully understand why the island is called Fuerteventura. 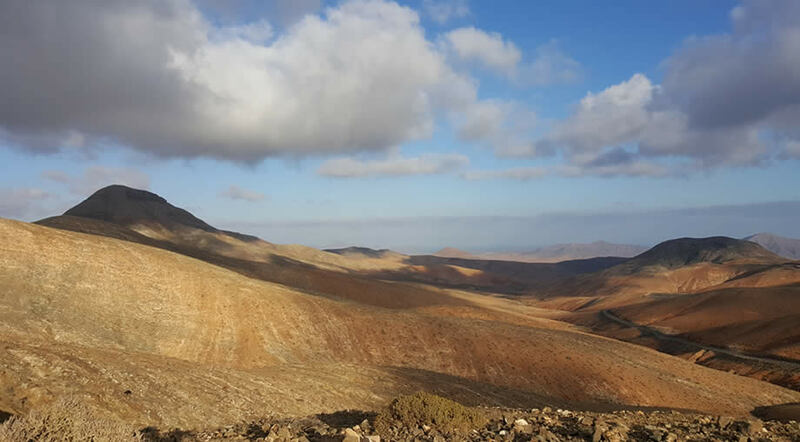 At the top you have amazing views over the desert that Fuerteventura is inland and also beautiful views of the ocean. If you have the chance to arrive at around sunset time you will have the most magical light, thanks to the Golden Hour that most photographers love so much. This place is not on the usual tourist route, so it's likely you will have the place all to yourself. However, the view from up there is incredible, probably the best view of the inland in Fuerteventura. Depending on where you are coming from, starting at the mirador you could drive towards La Pared Beach or Ajuy (in the opposite direction) and take a moment to admire the sunset on the west coast of the island. Fuerteventura - part of the Unesco Starlight Reserve. Mirador Sicasumbre is sometimes cloudy, but it's a great place for astronomical observation and the administration of the island said they will install supports for the people who want to bring their own telescopes or photo equipment for skyline images. Mirador Sicasumbre is a first step that Cabildo de Fuerteventura has made towards being included in the Unesco Starlight Reserve Initiative.